Human creativity is being shaped by software’s templates. Templates constrain our creative possibilities. Now people have more access to machines and are able to create music through inexpensive software and even phone applications. A fast quantitative analysis would show that the production of music has increased. But looking at this panorama from a qualitative perspective demonstrates that most of the massive music production becomes standardized. This is because users share identical hardware, software, clocks, tempos and sound libraries. In mass production of music, users share and recycle parts/sounds and the same structural approach to creation determined by software’s architecture. Templates shape social practices by setting an implicit use of the tools. Therefore users develop an uncritical approach based on default settings, not using the tools to their total capacity. Also, there is a tendency in software design to limit editable parameters, making the customization of programs more difficult. The concept of usability in software design often translates to limiting parameters to offer a user-friendly tool for a massive consumption of the product. Fewer clicks equals less prerequisite knowledge, and that derives into inclusiveness and more sales. The medium/machines are tools that are constantly shaping our creative process and imagination. In this context, I decided to build a critical and personal relationship with machines. 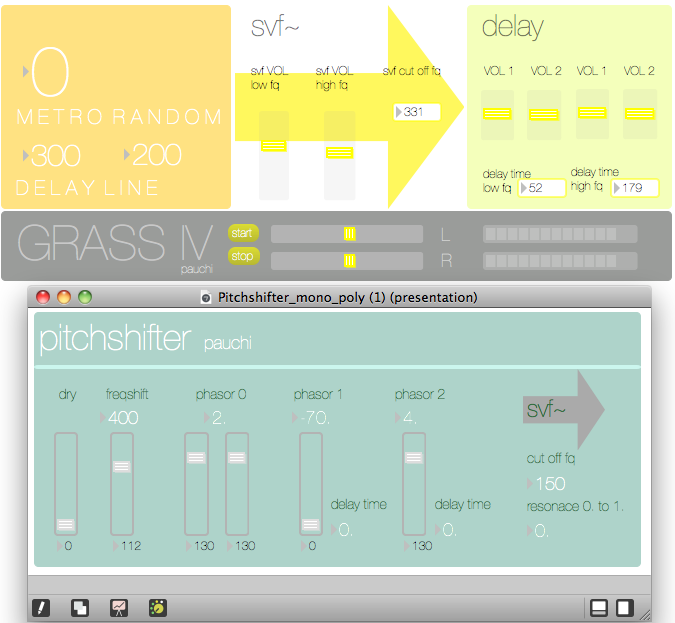 I started to produce my own sounds libraries, and to design and build my own instruments. The main criterion is to recognize the potential of each interface to deliver personal gesture. To build everything from scratch makes the creative process much longer, but I do believe it is a good artistic practice, since it assures the presence of personal aesthetic in my work. 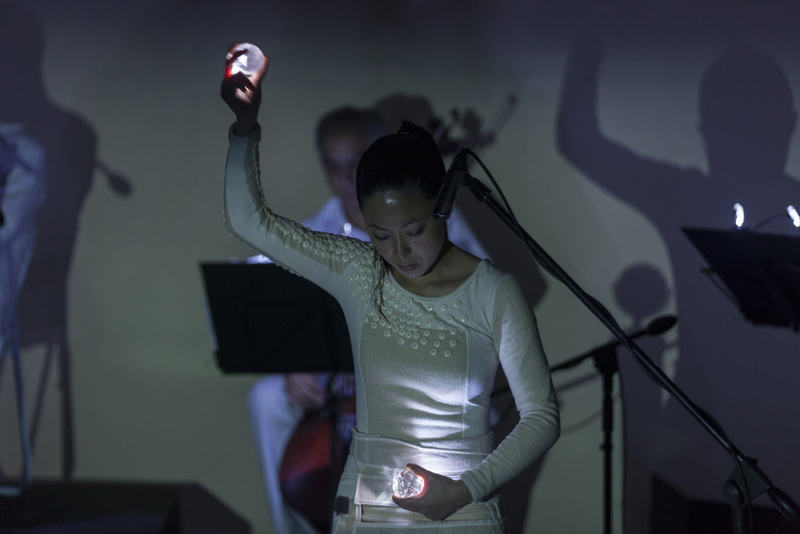 CONCEPT This project explores the embodiment and osmosis of sound. It consists of a wearable sound sculpture built with 96 speakers, 6 amplifiers and microphones. The image that inspired the Speaker Dress is the somatic process of a woman eating the outside world, interiorizing and digesting the external soundscape, and returning the sounds back into the environment. This project focuses on the relationship between the human body and the space, recognizing the skin as a symbol of boundary and filter between objectivity and subjectivity. PROCESS The dress demanded some electrical research, since it is delicate to wear gear on the body (specially if it is powered by more than 9 volts). The first time I wore the dress was in a site specific performance. Still it was a beta version and the calculations weren't perfect. At that stage I was testing different kinds of batteries, cables and speakers. Because of a wrong serial and parallel design, the ohms got way to hot for the system and it collapsed. One amplifier and my hair burned in live performance. After that, I had to reassemble the dress another 2 times until I got the correct electrical resistance calculations. Each assembly took me almost 3 weeks of non stop work since this dress is all hand made. COMPOSITIONS Sound pieces for this dress have to have very specific characteristics. The speakers have a limited frequency response because of their size. The lowest frequency that can be reproduced is 200 Hz, reason why the compositions can't have a focus on low sounds. Also, when a fixed tape piece is prepared for this sound sculpture, the mixing has to cancel the low frequencies in order to not loose power and amplitude in an inaudible sound. The system will always try to reproduce the low sounds and all that lost energy lowers the overall amplitude of the dress. Composing for this sound sculpture demands an awareness of the economy of energy in order to keep good levels. I found out that sounds produced by analog synthesizers achieve the higher amplitude. Every Speaker Dress made so far has been an exciting and challenging process. From the very beginning, the development and calculations for the Speaker Sress has connected the preciseness of the electrical components and the further composition of unique sounds that emerges from one’s self. If you are interested in acquiring your own custom-made Speaker Dress, feel free to provide information about your project. Each dress has been made and modified to deliver personal gesture, which requires commitment to the development and personalization of the dress. As a result, each piece takes up to two months approximately to be made, and prices varies according to time schedules, technical specifications and availability. Photo: Rolex© / Yann Rabanier, New York. Is an electronic violin with an attached Arduino Esplora microcontroller board. The purpose of this hybrid design is to enhance the electroacoustic performance, allowing serial communication of data (produced by a set of sensors) with Max, while performing the instrument. The Arduino uses the built-in sensors to control the Max’s processing of the violin’s audio. Is a motion-tracking instrument developed in Max that utilizes a webcam as a visual sensor. The light of crystal spheres was a technical solution to the ambiguity resulting from the camera’s seeing both the visual trigger of my hands and the moving images projected over me. By having a brighter element in my hands, I was able to discriminate light intensities through calibration, focusing the triggering of actions to the movement of my hands. Is a controller made of Plexiglass, neon lights and homemade bend sensors. The sensors are hung as strings inside the structure. They are made of Velostad, a conductive paper that senses intensities of pressure. Is a cracklebox (built around an NTE909D integrated circuit) encased in Plexiglass. Using long contact ribbons (made of copper tape) facilitates the production of a wide range of frequencies. In this instrument, the human body becomes part of the circuitry, determining the timbre and pitch of the emitted sound.